A football club's plans for a new stadium have been resurrected after councillors strengthened its case in their local plan. 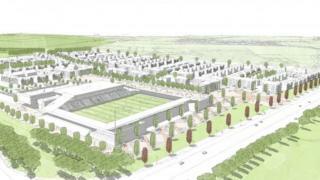 St Albans City unveiled a proposal for a 6,000-capacity ground on green belt land off Noke Lane in March. The district council did not include the site in its local plan but the latest draft supports the "principle of the development of a new stadium". The club said: "We're going in the right direction." Club co-owner John McGowan said: "We're very happy and very grateful to the local authority and all the councillors for supporting our plans. " In March, St Albans City & District Council said the stadium, part of a development of housing and business units close to the M25, would encroach on areas like Bricket Wood and it would prefer a site that would cause "less harm to the green belt". In the latest draft, now out for consultation, the Noke Lane site is not named but as well as supporting the idea of a new stadium it has said a green belt development may be approved "if very special circumstances can be clearly demonstrated". Mr McGowan said he was happy the site had not been named because if it was included in the district's preferred sites for development, it could take five years to come to fruition. Four sites are under consideration for the stadium and not naming a site means they can put in a planning application sooner. "We're running out of time and money and the council have been so good helping with the wording [in the plan] to allow us to make an application within six to 12 months," he said. "Noke Lane is our preferred site but things could change while the process is going on." St Albans City, of National League South, currently play at Clarence Park, which has been the club's home since its formation in 1908. The ground's capacity is 3,700, but the stadium, in a Victorian park, cannot be developed further.